My beautiful Bean is gone. Her name was inspired by a Jane Siberry song, ‘Everything Reminds Me of My Dog’: She has a line about Old folks remind me of my dog/My dog reminds old folks of their dogs (Barfy, Ruffo, Beanhead). . . . Bean! That’s it. Chelsea had been driving my roommate and me crazy with her constant talk, so I thought another cat might help chill her out. I was in Minneapolis at the time, a couple of houses down from friends, and they went with me to the Humane Society to get a kitten. We saw one group of kittens, then went into another room (the sick cat room, it turns out) for more. I had the name; I needed the cat to fit. And then I found my Bean—full name, Beanalea—and took her home. She lived with Chelsea and me in three apartments in Minneapolis, one in Montreal, one in Somerville, and five in Brooklyn. She didn’t particularly like travelling, but she always settled in once we had, in fact, settled in. Bean, Beanalea, Bean-goddammit (for a brief period when she was around 6 months), Binkins, Polar Bean, Lima Bean, Navy Bean, Gah-bahnzo Bean. . . she was my Bean. Oh honey. I’m so sorry for your loss. I know you knew it was approaching, but that never prepares us, not really. I’m so glad that you and Chelsea and Bean all had each other for a time, and so sorry that time was too short. It’s always too short. I hope you’re surrounded by people who know who Bean and Chelsea were for you, and are being held in loving arms. I’m glad that you have Jasper to hold close. I’m so sorry to hear that Bean is gone. Even though you were anticipating it, the loss is still striking. Hope you’re doing okay. The past the last few months was to decline, then stabilize. A couple of weeks ago I thought I’d have to put her down, but she managed to bounce back, enough, for me to say, well, she’s clearly not ready. Two nights ago, tho’, in the middle of the night, she got sick; when I came home from work it was clear that it was time. I’d have taken her in that night, but I couldn’t make it to the vet before it closed. So I came home from work early yesterday to take her in, but she was already gone. I’m sad that I wasn’t with her when she died, but I’m glad she was at home. 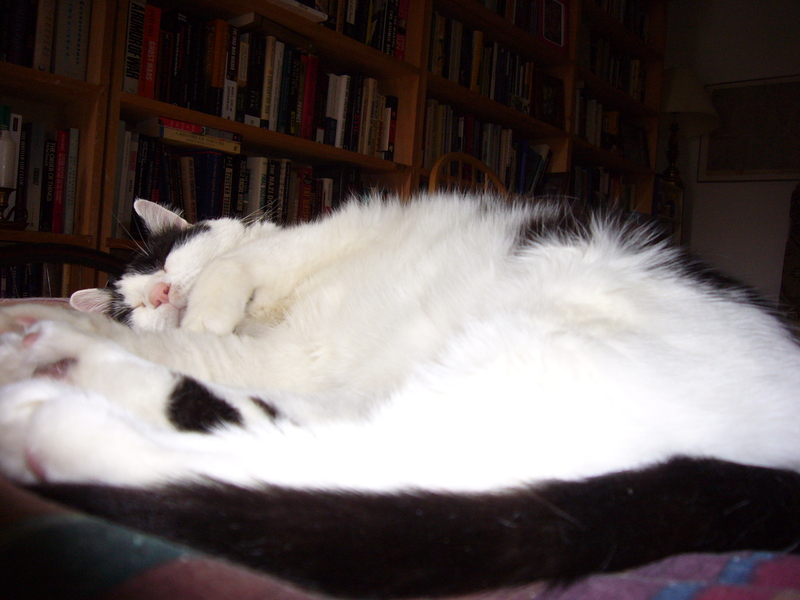 She was a good cat—even in those moments of Bean-goddammit—all of her sixteen years. Yes, she was a good cat, and I will miss her. I’m so sorry. It’s never easy. These animals find a little place in our hearts and nestle in there. Give Jasper lots of hugs. My girls send their love and sorrow. They only met Bean briefly but loved her.